Commercial fishing is a dangerous and challenging occupation. The risk of injury is always present. Although the U.S. Coast Guard requires one or more crewmembers to be first-aid and CPR trained, most first-aid courses assume there will be quick access to an ambulance and hospital. The more likely scenario — fishermen will need to use their training during a long, physically demanding day in rough seas. With this in mind, a team from Oregon State University developed Fishermen First Aid and Safety Training (FFAST). The course customizes existing wilderness first aid training to better prepare fishermen to prevent and treat injuries encountered at sea. The training considers small crews, common injuries, vessel environments, cold water, rough seas and delayed emergency response times. FFAST is an outcome of a three-year grant from the National Institutes for Occupational Safety and Health, led by College of Public Health and Human Sciences Assistant Professor Laurel Kincl. Thanks to a grant from the Oregon State Marine Studies Initiative, this is the third year that Oregon State is hosting FFAST on the Oregon coast. This year’s course will take place in Port Orford, Oregon, on October 30-31. The cost is $50 per person. 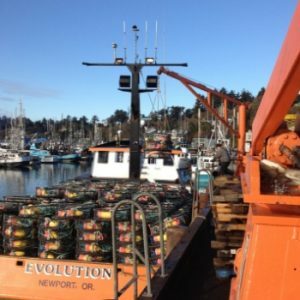 Other project collaborators include Oregon Sea Grant Extension faculty Kaety Jacobson and Amanda Gladics; Oregon State’s Marine Studies Initiative, Servco Pacific Insurance and the Newport Fishermen’s Wives. For more information about FFAST and to register for the training, contact Amelia Vaughan at amelia.vaughan@oregonstate.edu or 541-737-1940. You can also find more information about the FFAST course and other fishing safety resources at flippresources.org.